All India Congress Committee secretary Manickam Tagore fell for a parody account and used it to attack Defence Minister Nirmala Sitharaman, calling her ‘unfit’ to be the defence minister. 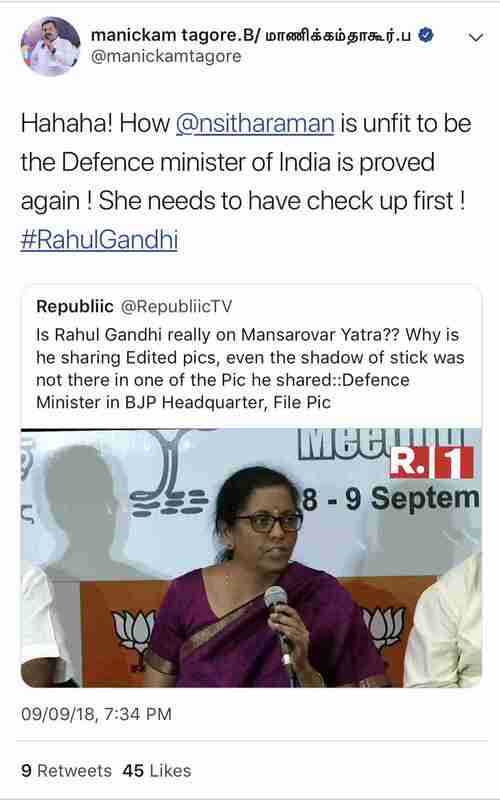 Tagore quoted a parody account of news channel ‘Republic’, ‘RepubliicTv’, which claimed that Sitharaman was questioning Rahul Gandhi’s Mansarovar Yatra because the shadow of the stick was missing. Tagore quoted this tweet and mocked Sitharaman, calling her ‘unfit’ to be the Defence Minister and that she should undergo checkup. However, Sitharaman called him out for falling for a parody account. He later deleted his tweet and apologised to the minister. It’s mistake ,I deleted the tweet also .Sorry madam Minister.